Just dream up a gadget and the Slonim brothers will make you a model. They’ve already sold over 10 million miniatures to the U.S. armed forces. TWO brothers were responsible for the greatest combined Army-Navy catastrophe in America’s wartime history. In one day, two U.S. Navy submarines and their supply ship were mistakenly bombed and destroyed by a flight of B-25’s. Not far away, a squadron of Navy TBF’s was obliterated by a shattering volley from anti-aircraft guns. Clearly to blame for these twin disasters of error were Joseph and Samuel Slonim. Yet, they never went to jail. They were never even investigated. In fact, they got close to $5,000,000 for their trouble from Uncle Sam. Yes, the tragedies took place—-but only in miniature! Shortly after Pearl Harbor, the armed forces decided to expand its training for quick and accurate identification of Allied and enemy war equipment through the use of authentic miniatures. These called for sturdy metal construction and accuracy even down to the rivets of tank and ship plates. For this purpose, the U.S. Government bought close to 10,600,000 precision scale models of planes, tanks, guns and ships from the Comet Metal Shop, owned and operated by the brothers Joseph and Samuel Slonim. Thanks to these tiny scale models, many of the most serious errors were averted in actual combat. For more than fifteen years the Slonims, still in their 30’s, have been working in what they like to call their magic house of miniatures, turning out solid metal models of almost anything for anyone. 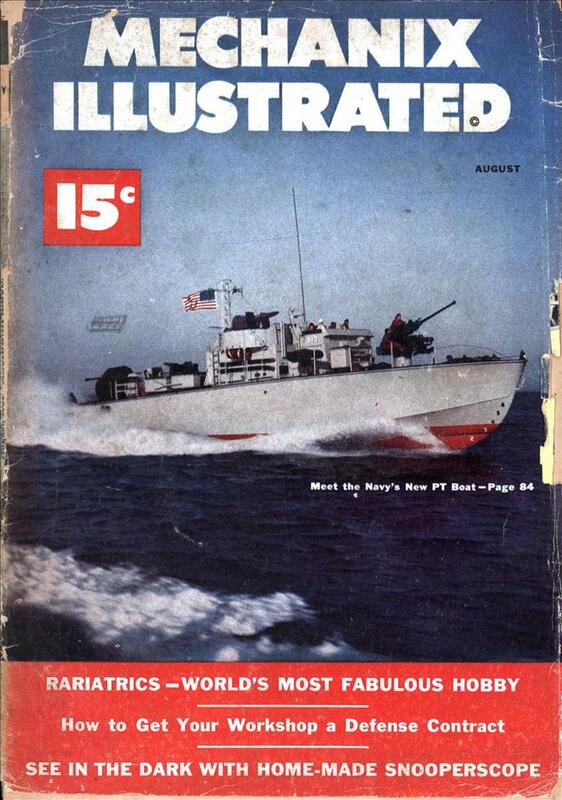 Although the government took all they could turn out during World War II—from $2,000 3-foot models of the USS Iowa to thumb -sized models of Sherman tanks—their work is definitely not limited to military affairs. They’ve made models for a wide variety of hobbyists, designers, doctors, engineers, teachers and dentists. A good many of their individual orders come from professional and amateur inventors. One of the original wall-type can openers, for instance, was first made as an authentic model for its inventor in the Slonim shop. It was urgently needed by the inventor in order to get cash backing so they turned it out for him in record time at a cost of $200. But from it he was able to get on the road to a private fortune. The Slonims have developed their own secret casting process, which to this very day is protected by patents. Their process made possible precision casting with lead in such a way that delays of from two to four weeks were cut down to as little as 72 hours. For the first time, it became possible for an American outfit to compete with the accuracy of hand-made imported toys. Soon, the Slonims added the registered word Authenticast as part of their business name and orders from department stores poured in. Today, the Slonims annually get more than $250,000 worth of toy orders alone from the country’s department stores and from stores in such far away places as Hong Kong, Israel and Turkey. They employ about 50 skilled workers—designers, die casters and machinists—and keep 14 salesmen on the road selling in practically every state. Their toy catalog, which they sell for 25 cents even though it costs them about a $1 to produce, is in great demand not only from store buyers, but from collectors and hobbyists as well. The toy soldiers, accurately garbed in the uniforms of dozens of nations, are only a few of the more than 6,000 items listed in their present catalog covering almost every phase of life. Within recent years, their precision cast toys have found a practical use with top American firms. Plant engineers have learned that they can save thousands of dollars in costly plant-moving errors by first rearranging floors with scale models. 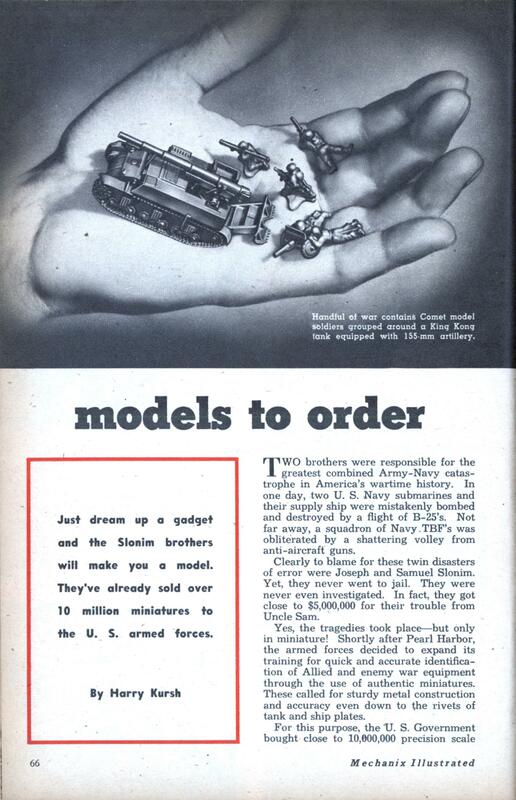 But perhaps their most famous individual customer is Douglas Fairbanks, Jr. An avid toy-soldier collector, the celebrated screen actor has already gathered more than 200 miniature soldiers of all nations in authentic uniforms from the Slonims. That kind of tight-lipped patronage from the Slonims has brought inventors flocking by the hundreds to their doors at 91-06 132d St., in Richmond Hill, N.Y. Even though inventors seldom need more than an original model for patent purposes, many take advantage of a special filing service. The Slonims will keep all original die parts on file at the request of customers and guarantee their preservation. In the event of a demand for quantity cast reproductions that could cost an inventor as little as 8 cents each, the Slonims merely pull the die off the shelf and cast models for him just as authentic as the original. “Trouble is,” says Joe, “too many inventors think that because a die is made of steel and you can’t scratch it with your fingernail, it can’t be damaged. One successful inventor paid $950 to have his original patent model made by the Slonims but he insisted on taking his die home with him. When he came back to have reproductions made to aid him in his already established business, it was so badly damaged that it cost him another $350 to have it put into working shape. Very often inventors come to the Slonims with only a crude sketch and a mental image of the kind of device they want to patent. Wherever possible, the Slonims will work with such an inventor step by step, until they get accurate drawings and blueprints of whatever it is he has in mind. Once that’s settled, it’s a simple matter for Slonim shop craftsmen to turn out a solid metal scale model, whether it be in alloys of lead, zinc, aluminum or bronze. No order is considered too trivial for a Slonim Authenticast. Earlier this year, the shop received a bulging envelope from a midwestern department store. It contained an order. For hours, the Slonims waded through all sorts of paper forms the store had sent to be filled out. Finally it turned out that all they wanted was one tank. Total cost—60 cents! In contrast, one major oil and heating company is now having the Slonims make up a $2,000 4-inch cross-sectional scale model of one of their huge stoves for use in training salesmen. After that, at little more than the cost of a pack of cigarettes for each, thousands will be cast from the original and mounted on wood as desk souvenirs for the company’s potential customers. How much longer the Slonims will be available to private industry is anyone’s guess. Right now, the armed forces have dropped a $100,000 contract in their laps— the Slonims are still the only ones they can turn to. they developed their own secret casting process… which was protected by patents… which require the patented process to be described in public detail. huh?